Stamps and Stitches: Hot Dog!! How ADORABLE!! Your daughter did a great job! That's the cutest dog house I've ever seen too! SWEET! Thank you for using my stamps! Oh wow, she did a great great job! How cute! She did a great job. I love it! This is so adorable. She did a great job! Wow! Your daughter has it going on! Must be hereditary! :) I loved your other posts as well...that cat quilt was amazing! Wow...the food allergy is very limiting, isn't it? I could not imagine moving to a place like Japan and trying to navigate that! And we eat out 2 times a week a well. Too hard with all the activities. Or maybe I am just that disorganized! Too cute! Love the fun feel of your card. 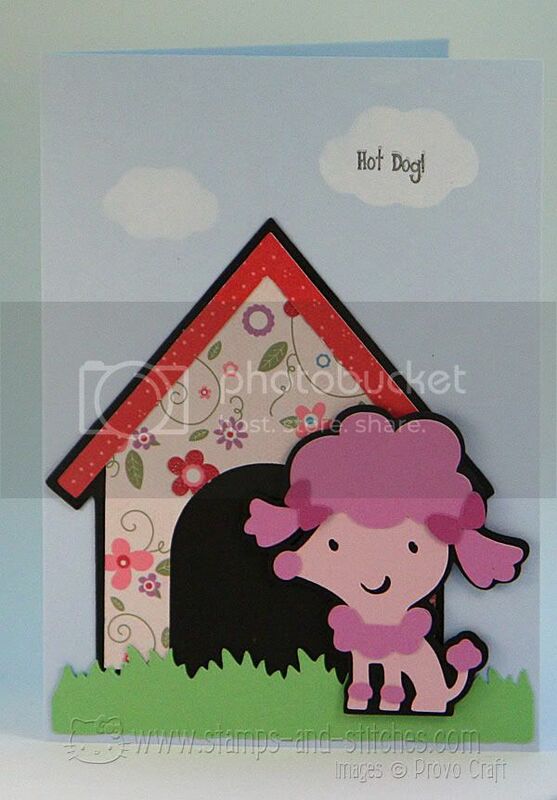 The flowery dog house is just awesome! Great sentiment! This is simply adorable... your daughter did a fabulous job. Can't notice any funky looking cutting, but I am sure it's there if you say so.lol.